Are the remains of over 2.1 million jews really buried in the alleged mass graves? 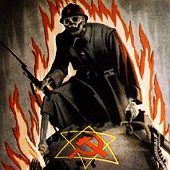 It is alleged in orthodox historiography that; during WW II - hundreds upon hundreds of thousands of corpses were buried in numerous “huge mass graves” at Belzec, Chelmno, Ponary, Sobibor and Treblinka II. However, despite all the deceptive allegations to the contrary, the truth is; the largest (in terms of quantity of remains) of the - one hundred - graves / cremation pits that are alleged to have been scientifically proven to currently exist at these sites, in which verified human remains have been tangibly located via bona fide, verifiably honest and conclusively documented archaeology; contained the remains of - ONLY SIX PEOPLE. How can anyone believe that approximately 2.2. million people magically disappeared at these five camps? Because they have been told this happened and never give a moment to think this through. They don't care, don't want to discuss it, think it's an unedifying subject and many think that the jews are the most persecuted people on God's earth and shouldn't be questioned. That's why. When I have spoken to believers about their belief they seem to either get aggressive and think I am some sort of rabid Hitler loving nazi, (I am not) or act all offended that we should even be talking about the possibility that there were no gas chambers and 6m dead. $1,000.00 - will be remitted for each one of the 100 fraudulently alleged / insinuated - mass graves / cremation pits - of Belzec, Chelmno, Ponary, Sobibor and Treblinka II - which have been scientifically proven to actually exist and to currently contain the remains of at least 21 people - ($500.00 for at least 7). Outstanding reading. bear in mind, some people, such as myself are collating and researching from scratch so this provides valuable information. Tautologous history has a lot to answer to. That and also I noticed most people are just so busy with their jobs, school, family and or other responsibilities. That most just don't have the time to sit down and think about and research into these things. You have that and the ignorance of most people on this topic is the reason why most just don't understand what really happened. Ratross wrote: Outstanding reading. bear in mind, some people, such as myself is collating and researching from scratch so this provides valuable information. Tautologous history has a lot to answer to. Eric Hunt has a lot to answer to as well. that the Germans had destroyed all traces of the Camp. In fact, they left buildings, fences, rail lines, roads, and a few graves. This evidence was destroyed by the Soviets and Poles after September 1944. Thank goodness that CODOH works to preserve evidence and scholarly discussions for people to read. I heard a rumor a while back that THE HOLOCAUST ARCHAEOLOGY HOAX website was going to add Auschwitz to the 5 camps listed above. 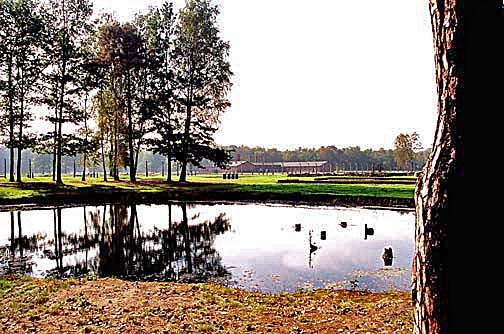 ...the ashes were thrown into the pond shown in the photo below, which I took on my 2005 trip to Birkenau. 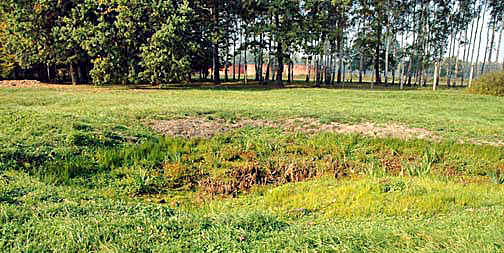 Each of the four crematoria at Birkenau had its own ash pond. The ash pond for Krema III was completely dried up when I saw it in 2005. The photo below shows the ash pit where the ashes from the crematory ovens in Krema II were thrown. Crystal -- The situation with Auschwitz is trickier: according to the Death Books approximately 66,000 people died in Auschwitz by late 1943 alone. Obviously, none of these are claimed to have been killed from poison gas. Note that Belzec, Chelmno, Sobibor and Treblinka are missing from the Death Books. According to the standard narrative, over 1.1 million people were murdered at Auschwitz, mostly in ridiculous gas chambers which allegedly used Zyclon-B. The ash content of a human body makes up about 5.6% of the body's weight; given a 132 lb. body, this comes to 7.3 lbs. That would come out to about 8 million pounds of remains, if everyone was cremated. 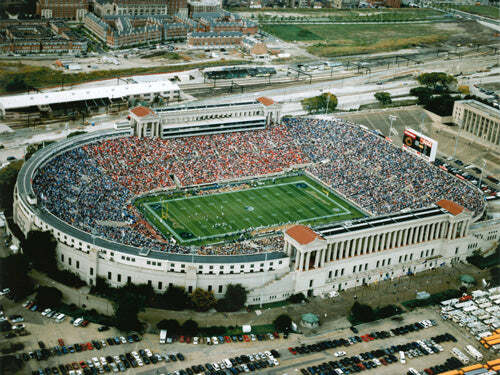 Soldier Field stadium seats 61,500 people. 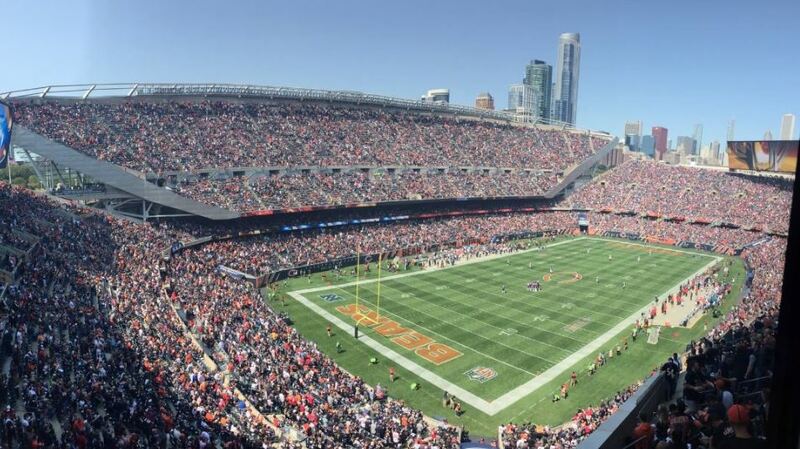 That would mean the alleged remains of 18 stadium-fulls is supposedly found at Auschwitz... in these ponds? Although cremated remains are typically referred to as "ashes," they are not ashes in a traditional sense. During the cremation process, a machine heats up the body to a temperature much higher than a typical oven. At the end, all that is left is bone and some trace amounts of any metals in the body from implants, fillings and other similar things. In modern cremations, the bones are later pulverized and run through a system that removes the metals. The result is a collection of very fine bone fragments, weighing a few pounds. Bones do not disintegrate over time. If there were indeed millions of pounds of burnt remains at Auschwitz, these bones/bone fragments would be easy enough to find. Especially if they were poured in these alleged "ash ponds" that have since dried up. Crystal -- do you have any sources documenting huge reservoirs of ashes found at Auschwitz? Can you show these massive heaps of cremated remains that would necessarily be there? And, would you conclude, based on the quantity found, that this is more consistent with the allegation that around 65-70,000 people (~500,000 pounds of remains) died at Auschwitz, as suggested by Joachim Hoffmann, renowned German historian (in "Stalins Vernichtungskrieg" pg 302) + the International Red Cross Arolsen records... or the claim of 1.1 million (~8 million pounds of remains) people as alleged by Franciszek Piper & Yad Vashem? I checked your link, and do not see any ashes. Crystal -- do you have any sources documenting huge reservoirs of ashes found at Auschwitz? Crystal -- can you show these massive heaps of cremated remains that would necessarily be there? 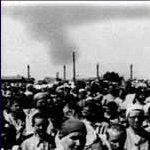 Lamprecht wrote: Crystal -- do you have any sources documenting huge reservoirs of ashes found at Auschwitz? - We see no proof of human ashes, bones, remains, etc. ; only unsubstantiated claims. Where is the forensic, scientific, & DNA analysis? - The posted YouTube is simply laughable. The unhinged Zionist nutter Jacob Bronowski has not the slightest idea what he's talking about. He even uses the old Communist "4,000,000" for Auschwitz. He rambles on about 'science, but then talks about the 'gas chambers, which were in fact scientifically impossible as alleged. - You posted a picture of a mound. Now prove that there are massive human remains within it. No alleged immense human remains to be seen in alleged known locations, no 'holocaust. One cubic meter of space could fit the burnt remains of 400-500 people. At Auschwitz, it is alleged 6,000 people (or roughly 12 cubic meters worth) of people's remains were produced every single day for months at a time. This bone ash is not soluble in water and would necessarily be lining the bottom of the pond... if not filling the entire pond. Lamprecht wrote: Crystal -- can you show these massive heaps of cremated remains that would necessarily be there? Your own source says that image is the "Remains of “the little white house” at Birkenau"
Obviously, this "bone ash" is comprised of mostly calcium. In contrast, soil is generally between 1-2% calcium. In contrast, it is typically claimed over 1.1 million people were murdered at Auschwitz. For this to be true, that would mean about 8 million pounds of burnt remains was produced, with a volume 2,200 to 2,750 cubic meters. Let's just round down to 2,000 for convenience sake. If the nazis allegedly murdered 1.1 million and cremated these remains, that 2,000 cubic meters of remains could fit entirely on an American football field, which is 5,351 square meters. 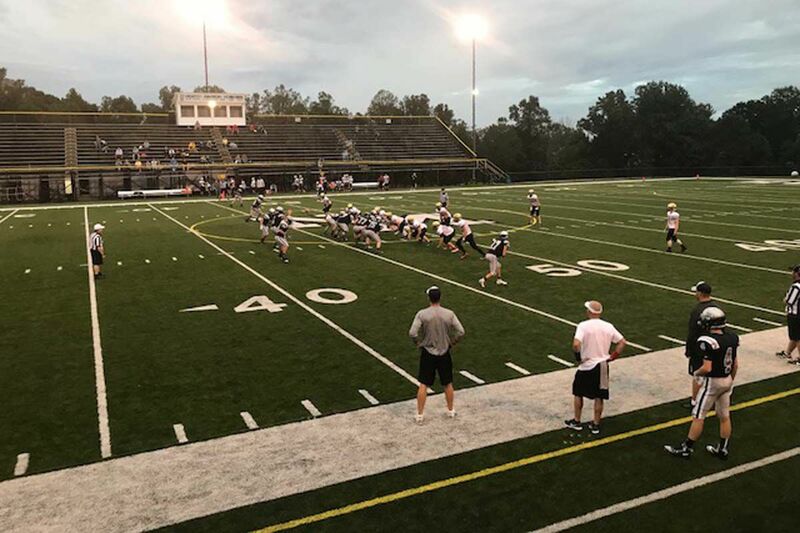 The remains, if evenly distributed on this football field, would be 37 centimeters high, or 14.6 inches... which over a foot. So, Crystal, do you seriously believe that there exists at Auschwitz the burnt remains of over a million people, with the volume equivalent of bone ash equal to an entire football field with over 1 foot high of bone ash covering it? Please note that the 66,000-70,000 people who died, according to the sources cited above, would also have been cremated and their remains should be there although that does not suggest or imply that Auschwitz was a death camp. I am not quite sure how this millions of pounds of remains could be magically lost in a pond. It would fill up the entire pond. There would be enormous pits full of ash, as well. which could be excavated. The posted YouTube is simply laughable. The unhinged Zionist nutter Jacob Bronowski has not the slightest idea what he's talking about. He even uses the old Communist "4,000,000" for Auschwitz. He rambles on about 'science, but then talks about the 'gas chambers, which were in fact scientifically impossible as alleged. Mr. Bronowski may have been off a little on his figures. So instead of the remains of 4 million people buried in one pond grave, we now know that the correct figure is the remains of 1.1 million people were buried in 4 pond graves. Lamprecht wrote: I am not quite sure how this millions of pounds of remains could be magically lost in a pond. It would fill up the entire pond. It's obvious that the ponds are very deep. And I"m not saying that the remains were magically lost. I'm sure the Nazis put a thick layer of soil over the remains to hide them. They wouldn't have gone through all that work to hide their crime just so someone could come along later and simply scoop up proof of mass murder. 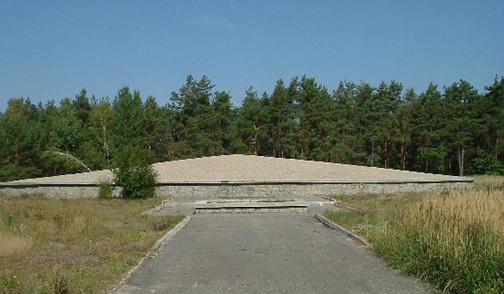 At Sobibor there is a pile of ashes in a memorial, which is shown in the photo above. This memorial contains the ashes left from the bodies of 170,000 to 250,000 prisoners. Why doesn't Mr. Gerdes consider the Sobibor memorial as one of his mass graves? If he did, I would accept his challenge and claim his reward in a heartbeat. The fact is that this knucklehead as just reciting what his Zionists / communists made up out of whole cloth. No we don't know "that the correct figure is the remains of 1.1 million people were buried in 4 pond graves." I have challenged you to produce the proof. Now show us your alleged remains. No dodging at this forum. Nonsense again. There are no remains of 250,000 Jews there. They cannot be shown to be there, that's why what is essentially a pile of dirt is sealed off. It's all theater & propaganda. If they could demonstrate through forensics analysis and DNA testing that there is 250,000 Jew remains there we would have seen it. In fact we would be seeing it 365/24/7. 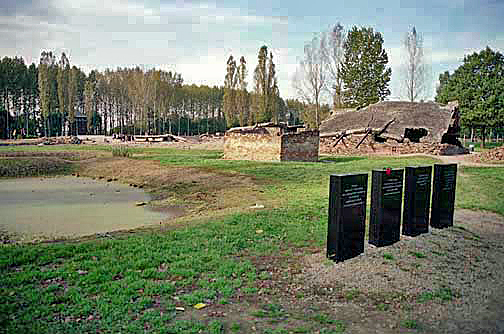 Alleged location of Treblinka mass graves / remains of 900,000 Jews according to Treblinka officials, no alleged remains exist. Imagine trying such laughable crap in a legit court of law. Crystal wrote: Mr. Bronowski may have been off a little on his figures. So instead of the remains of 4 million people buried in one pond grave, we now know that the correct figure is the remains of 1.1 million people were buried in 4 pond graves. It does not seem that the ponds are very deep. In the video, he stands in the pond and it only goes up to his ankles. In another photograph, from your own source, the "ash pond" (where a bunch of plants are growing, something that wouldn't happen if there was a thick layer of ash lining the bottom) has no water in it. So, allegedly, they dug a massive trench, filled it in with burnt remains, covered these remains with soil, and then left a depression in the ground, causing it to turn into a pond? This does not make any sense. Numerous documents from the Zentralbauleitung (Central Building Administration) of Auschwitz-Birkenau written between 1941 and 1944 refer to very high water tables at Auschwitz Birkenau. "The soil characteristics are poor. Underneath the humus soil are loam and chalky clay, with imbedded gravel and subterranean sand banks of lesser dimensions. The ground water level fluctuates between 0.30 and 1.20 m. The terrain is marshy at the present time." "The soil characteristics are poor. Underneath 25 cm-thick layer of humus, loam appears, with imbedded gravel and subterranean sand banks of lesser dimensions. The ground water level fluctuates between 0.30 and 1.20 m. The terrain is marshy at the present time"
There are, in fact, documents detailing the use of hand-pumps to drain a large pit being used for the construction of a sauna at Birkenau between February 6 and August 7, 1943. Do you seriously believe the nazis went through all that work, to dig massive pits, drain the water, fill them with millions of pounds of burnt remains, then covered it with a layer of soil, and then allowed the rain to turn the remaining pits into huge "ash ponds"? This sounds absurd, and to date, nobody has provided a core sample or excavation of one of these alleged "ash ponds". What is the estimated volume of this alleged pit? What is the estimated percent that is burnt human remains? Why would the nazis just pour all the ash in a huge pile like this, when they could have instead covered it with a layer of soil or made an "ash pond" like at Auschwitz?